Earlier today, I wrote about the latest version of USB Burning Tool, and noticed added support for Amlogic “905D2” processor in the changelog. I had heard about Amlogic S905X2, but S905D2? Never. I could find information in some recent Buildroot/Linux release notes, and as one would expect it’s another quad core Cortex A53 processor, and likely an update of S905D processor targeting set-top boxes with multiple independent tuners. There’s no mention about TS or DVB, but it appears the processor may be clocked faster likely due to a newer manufacturing process – just like S905X2 -, and the Mali-450MP GPU has been replaced by a more recent Dvalin GPU supporting Vulkan and OpenGL ES 3.2. U200 (S905D2) reference platform is based on the processor, and comes with eMMC flash, Ampak AP6398S 802.11ac WiFi + Bluetooth 5 module, and 2GB DDR, and it looks like SZwesion may be working on a S905D2 Khadas Vim board too. While searching for more information on the processor, I found out initial support for S905D2 was added to Zircon, the kernel used in Google Fuchsia operating system. It’s still unclear what Fuchsia OS will be used for, but Google employees are actively working on the project, and while development hardware platforms are now all based on Intel processors, platform-defs.h linked above has plenty of references to Amlogic processors, so I’d suspect Fuchsia may end up in media streamers, possibly the next revision of the ChromeCast, or even new version(s) of Google Home smart speaker via Amlogic A113 also supported in Zircon. It also looks like Fuchsia development are working on development boards support such as Hisilicon Kirin based Hikey 960, and Amlogic logic based Khadas Vim 2 or ODROID-C2. I think the 1.9 GHz might be the real frequency, not the fake 2.0 GHz (actual 1.5 or even 1.4 GHz) announced a few years ago. If that’s the case, it’s still progress. The GPU on these low end devices are basically for offloading the drawing UI. For any actual rendering, CPU is faster believe it or not. A decent CPU could stand its ground against an entry-level GPU on some GPGPU task, but unless by rendering you mean running just a vertex shader on a relatively small vertex buffer, there’s no way a quad-A53 would be faster at actual rendering than any Mali. S905D2 is S905X2 with DSI pads. Big improvement is 14nm fab so the thing will consume even less power than S905X which was recently certified for Google TV. Dvalin is Mali-G31. 1.9GHz is the top end of what you can get on 14nm for stock Cortex-A53 cores. So Allwinner H6 with A53 @ 1.8 GHz with a 28nm process is what exactly? Cortex-A53 has a fixed 8 stage pipeline. Even if you were to fabricate it on 7nm, the clock speeds would not improve significantly before it runs off the power cliff. The high performance Cortex-A7x cores have design-tunable stages for higher clock rates. So 1.8GHz are possible with 28nm too and maybe Amlogic’s new SoCs are 20nm or even 28nm (and the 1.9 GHz are a fake number as usual and less in reality). On what is ’14nm’ based? Khadas confirmed they are working on a S905D2 board, but are unable to share details at this stage. In unrelated news, Khadas Edge based on RK3399 should be launched soon. RK3399 seems like a race to the bottom with ODROID, Pine64, Orange Pi, and Khadas all going at it. These SBC makers need some creativity rather than copy and paste while not hiring/paying software developers to support the boards. The two good companies with RK3399 are Firefly did built the first board so long ago and Vamrs is working with 96boards. Amlogic seems to have cornered the TV box market and wants to completely dominate it. Where is Allwinner in all this? Supports HDR10, HLG hdr standards and usb3. Better overall than the latest amlogic s905x/s912 chips in terms of media tv box unless you need 4k 60fps. It would be nice to have a newer 14nm chip with more hdr standards, higher cpu clock speeds and mali g31 and 4k 60fps from rockchip though. Well at least for hardkernel (odroid), they’re really working on the software and keeping their products maintained and up to date. I don’t remember when the first Odroid-U was released but I believe by then they were running something like 2..6.35, and since then it has evolved via many variations to XU4 & HC1/MC1 which now supports 4.14 LTS. These vendors don’t really copy each other, they’re mostly in the race to release first, and as such are copying as closely as possible the SoC vendor’s design. When you compare a few set-top-boxes based on the same SoC, it’s amazing how few differences you find between the DTS, sometimes even the GPIO for various devices are the exact same. Just because they’re in the initial design. Wonder when the 912 will start to show up? I assume you mean S922. We still have to wait a bit longer, as nothing is shown on Alibaba or Taobao yet. Ah yes, S922. I’m holding out for that full HDR support! With Intel screwing over the new J5005 with no HDR it looks like ARM based systems will be the only low cost way. I think you have to give credit that for a less than £30 a tv box with Netflix HD 720, [email protected], a box, remote, power supply and some OS up date, they are good value. In this low price value market 2 years is a long time . New CPU and features turn up and customer must have features, come and go quickly. What the TV box builders need now is to add value either by better feature supported OS or hardware features. fast USB 3, fast WiFi and Ethernet, Plug and play PCIE and customer expandable ram . Otherwise it is a race to the bottom and who can wear the most itchy hair shirt. IMHO. As to Mali 450, 400 for watching TV they meet the needs. For better GPU, then start using them for heavy graphics games. build AI in the games . Create the market to get the hardware you want or desire. IMHO. Well, I was about to make another annoyed comment showing that as usual they call each and every device S905-something even if it has nothing to do with the previous one, but at least this time they made some progress (CPU frequency, 14nm?, GigE is back, new GPU). We still need to be careful and not over-enthousiast though, it’s Amlogic, and surprises normally come after you buy the devices! It seems that S905X2 and S905D2 support USB 3.0 and HDMI 2.1! 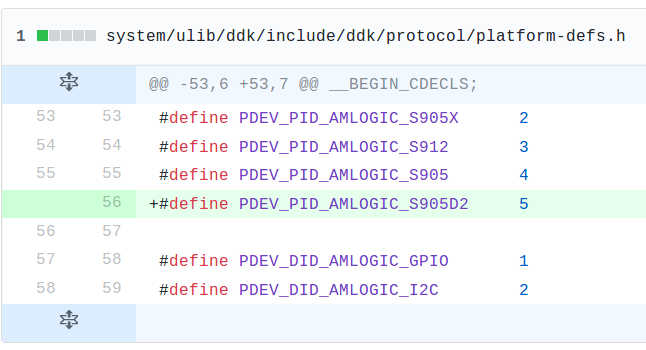 Would be launched with AndroidTV 8.1 (all the devices that use AMLogic’s new SoCs are expected to be launched with the TV derivative of the OS). And would support PCM audio, and an audio DAC. Next week Google would introduce its new AndroidTV dongle, so maybe by then AMLogic would officially launch the 2 new SoCs (I don’t think Google would launch a new device with an old SoC, when a new one is so close to be launched – previous rumors must have been inaccurate). The Xiaomi Mi Box is now getting the AndroidTV Oreo update! shame it doesn’t have an ethernet port and that many usb ethernet adapters losing their connection when you switch it off. Seems like the follow up SoC’s to the new popular 4x A53/Mali 450 combo will see a change to more modern GPU standards, meaning that even the lowest common denominators will now have baseline OpenGLES 3.0 support when the S905X2/D2 and Rockchip RK3326 will release with the Mali G31 MP2. I have some new information and Amlogic S905D2 should be expected around Q4 of this year.